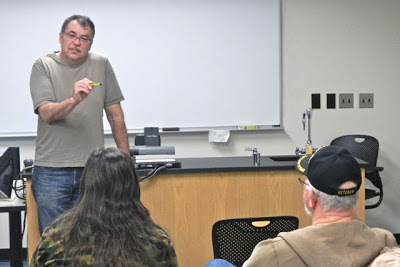 Jon Kerstetter, author of "Crossings:A Doctor-Soldier's Story" (Crown, 2017), conducts a seminar session during a 2013 weekend writing workshop in Iowa City, Iowa. In commemoration of a presentation on literary communities of practice at the 2018 War, Literature & the Arts Conference in Colorado Springs September 20-21, 2018, here's a quick mix of practical tips and philosophies regarding the conduct of writing events involving military service members, family, and veterans—and perhaps even people with no direct experience with the military! Usual caveats apply: "This list isn't everything. Your mileage may vary. Take what you need. Leave the rest." Despite what the military usually says, there is no single correct answer: In the Army, a "technique" is a way to get something done. Some techniques work better than others, depending on your mission, your capabilities, and your objectives. There are, for example, writing workshops that specifically include civilians—people with no direct military experience—and those that include only veterans. There are events that include military family members over the age of 17. There are women-only events. There are single-day one-shots, weekend workshops, and groups that meet every week for months at a time. Each of these models has advantages. Do what works for you. Always brief life-support and logistics up-front: Where is the coffee? How much coffee is left? Where are the latrines? When is lunch? Is there Wi-Fi? What's the password? Treat everything as fiction. I learned this from Pat Schneider's "Writing Alone and with Others." As someone who comes to writing first as a journalist, I love and celebrate all things non-fiction. And that includes memoir. (Fight me!) When offering responses to other's writing, however, it gives both writer and audience useful emotional distance to treat any piece of shared writing as fiction. Publish your workshop's Rules of Engagement. Nearly every U.S. Army After-Action Review begins with restating a few rules. Things like: "Everybody's perspective matters. There are no wrong answers. All of us are smarter than some of us." If the military can promote a mutually supportive, candid, inclusive, non-judgmental atmosphere, so can writing workshops. One Iowa non-profit, Writing My Way Back Home, even makes a practice of collaboratively reading a list of such "touchstones" prior to their weekend workshops. It is the only formal learning objective scheduled for the first evening's "welcome" reception. The first rule is: This is a safe space. People should feel free to share their work without fear, both at the event and after it. To paraphrase the line from the movie: "The first rule of Write Club is: You do not talk about Write Club." Do not share stories that are not your own outside of the event, without a fellow storyteller's explicit permission. At the same time, do not judge others by their stories. (See "fiction," above.) Do not engage in historical, political, or religious debates. Focus on the writing, and being supportive of your fellow practitioners. Establish your event as a "pursuit-free" zone. I took this directly from the Warrior Writers handbook, because it takes the "safe space" philosophy to a unfortunate necessary next-level: "Remind participants that are there for writing, not for dating. Flirting or other sexual advances can create a toxic workshop environment and cannot be tolerated." Older, male veterans: Bonus points for not implying that the young woman sitting next to you hasn't seen combat (you'd be surprised), or somehow isn't a veteran. And ... get your own coffee. Plan for mental health and wellness support. In the Army, you don't go to the firing range without a medic. A medic is someone trained and designated to provide urgent care, and, if necessary, evacuate patients to higher levels of help. Train event staff how to constructively react to people who are undergoing crisis, and how to guide them toward positive outcomes. Designate co-instructors, so that a class can continue if someone needs to leave. Reach out to campus or corporate counseling offices—they may be able to provide a trained volunteer to "hang out" at your event. Potential resources also include Mental Health First Aid and national Veterans Crisis Line. Conduct "buddy checks." Make sure that anyone suddenly leaves the room first gives a non-verbal "thumbs-up" that they are not in distress. If they don't, make sure that a designated buddy or assistant monitor that individual's well-being. If they need space, let them have space. But also let them know you're there if they need. Remember that "not all veterans are broken." Don't unwittingly play into the stereotype. Not every veteran has been diagnosed with Post-Traumatic Stress Disorder (P.T.S.D. ), or experienced Military Sexual Trauma (M.S.T. ), or describes their experiences in terms of moral injury. Individual responses to experiences with the military vary greatly. Listen to each storyteller as a fellow human. "Writing may be therapeutic, but it sure as heck ain't therapy." Don't package or market your event as an opportunity for "healing." Here, I borrow from the Veterans Writing Project, which consistently draws a bright line between advocating veterans' writing for literary merit (the public-facing side of that organization's mission), and the study of writing as a medically prescribed medical intervention for veterans (an activity that the organization supports outside of public view and participation). Break times are important. The poet Kahlil Gibran wrote, "Let there be spaces in your togetherness." People make connections over coffee, and over lunch. Attendees are often inspired to immediately put some thoughts and images down on paper. Make sure to provide ample times between classes, presentations, and other events. What are your ideas for better-/best-practices at military-focused writing workshops? Keep the conversation going at our pages on Facebook and Twitter!